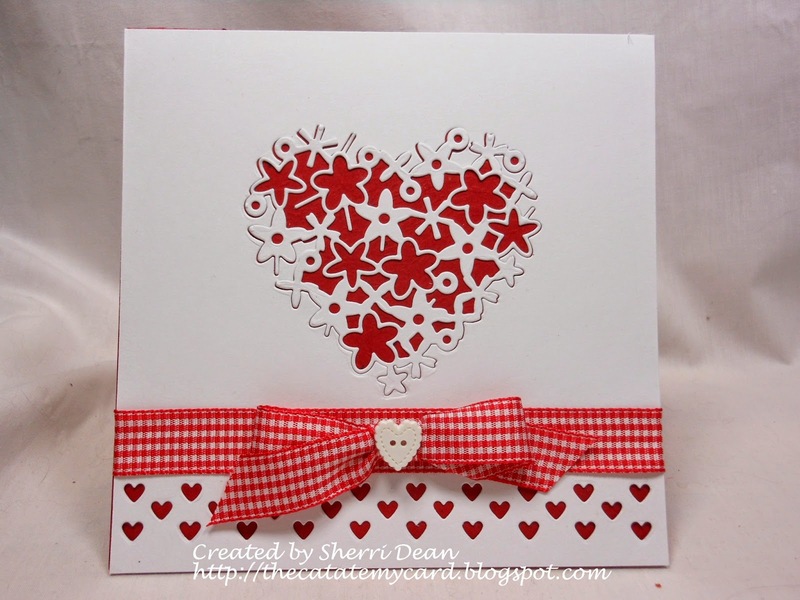 Dies R Us: Hearts, Hearts & More Hearts! Wednesday has rolled around again & it's my turn to share another card to give you some inspiration. I have so many Valentine ideas rolling around in my head based on the amazing dies that Dies R Us has in stock & I want to share another card with you today. This is a pretty simple card. Nothing very fussy and EXTREMELY easy to do! You only need 2 dies for this card, Memory Box Floral Heart and Impression Obsession Mini Heart Row. I began by cutting a piece of 5 1/2 inch cardstock (the same size as my card base) and laying my mini heart row die along the bottom edge. I then centered the Memory Box Floral Heart die and proceeded to cut both out at the same time. I glued my ribbon around the card before adhering the white cardstock to my red card. Once it was in place, I glued the Memory Box Floral Heart cutout into the negative space it left in the original cut. Presto! The card is done! It's so easy & yet so beautiful. I hope you have already checked out the inspiration from Mikha & Darlene and don't forget to come back tomorrow & Friday to check out what Robin & Alicia have in store for you! These gals all have amazing talent & you will get some great ideas! Check out the Dies R Us Challenge Blog too! A new challenge just started on the first & there is still time to enter for a chance to win a gift voucher to the awesome store! I'll catch you again next week! Happy crafting, everyone!! Love this simple but beautiful Valentine! How cool that you could cut both dies at once. The read and white bow with the sweet heart button finishes it off perfectly! LOVE!